Capture in-field weather information for on-the-go decision making. Accurate information is critical when making decisions surrounding product application, so it is important to use weather information that is specific to the operator and area being covered. John Deere Mobile Weather displays five critical values needed when determining the effectiveness of product application. True wind speed is wind experienced by a stationary object. Apparent wind speed is the total wind experienced without compensation for machine speed and direction. 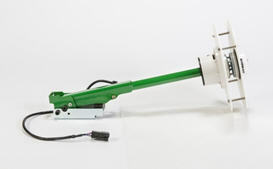 John Deere Mobile Weather utilizes a third-party weather sensor that connects to the John Deere Application Controller 1120. Weather data is collected and distributed to the Gen 4 4600 CommandCenter™ Display or 4640 Universal Display for viewing and documentation. A John Deere Mobile Weather activation is required to utilize the Application Controller 1120 in order to monitor weather information and is included with the purchase of the product. Producers running a Gen 4 4600 CommandCenter Display, 4640 Universal Display, or GreenStar™ 3 (GS3) 2630 Display are capable of documenting weather data; all other compatible GreenStar 2 (GS2) Displays are only able to display the weather data without the ability to record. Weather information collected on a Gen 4 Display is compatible with the John Deere Operations Center. Once the weather information is collected in the GS3 2630, it can then be transferred to APEX™ software system for further analysis and record keeping. APEX has the ability to map air temperature, wind speed, and Delta T, while wind direction and humidity is available to be seen within the summary information. Utilize the customizable alerts and weather information to make educated decisions about when to spray. Monitoring temperature, wind speed, wind direction, Delta T, and relative humidity on the go allows operators to quickly and easily understand if the weather conditions are favorable or not for product application. Built-in alerts make it easy for operators to set operational parameters to know when unfavorable weather conditions are present. Having weather information in the cab allows operators to increase product efficacy and decrease the risk of chemical drift. Delta T is a calculation that indicates the acceptable conditions to apply product; the value indicates if the product applied will evaporate prior to being absorbed by the plant. Delta T is a calculated by subtracting the wet bulb temperature from the dry bulb temperature. When applying, Delta T should be between 2⁰C (4⁰F) and 8⁰C (14⁰F), and not greater than 10⁰C (18⁰F). A higher Delta T value results in a faster evaporation rate and shorter droplet lifetime. 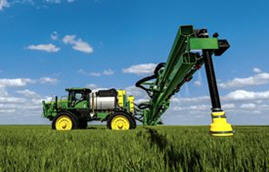 Applicators can utilize the customizable alerts to notify the operator when Delta T is too high and product application is not favorable in order to ensure maximum product effectiveness. 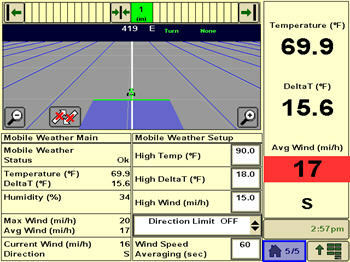 John Deere Mobile Weather provides system accuracy within +/- 6.4 km/h (+/- 4 mph) up to a 64.3 km/h (40 mph) apparent wind. Apparent wind speed is the total wind experienced without compensation for machine speed and direction. Operating with a headwind and tailwind increases vehicle turbulence, negatively impacting wind speed accuracy. For optimal performance, Mobile Weather is recommended to be utilized in vehicle operation speeds less than 32 km/h (20 mph). John Deere Mobile Weather is not recommended for use in dry-box applications. NOTE: Specifications are for a new sensor. System performance may vary based upon application. NOTE: When the wind speed is less than 7.4 km/h (4.6 mph) and/or air temperature is below 0⁰C (32⁰ F), wind, temperature, and relative humidity readings will be less accurate. NOTE: RMS error is a measure of the differences between values predicted by a model and the values actually observed.